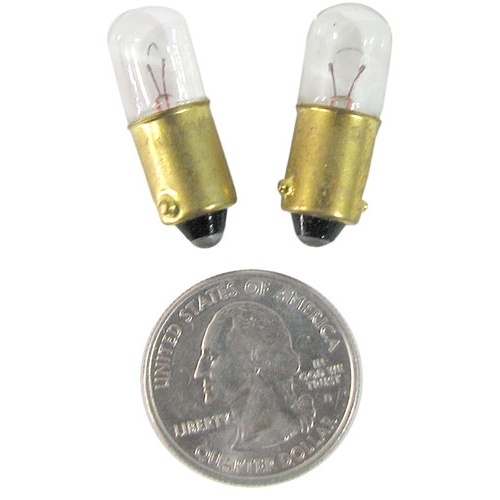 Itty bitty Edison style 1/4 Watt lamp with a 3/16"/5mm screw base. 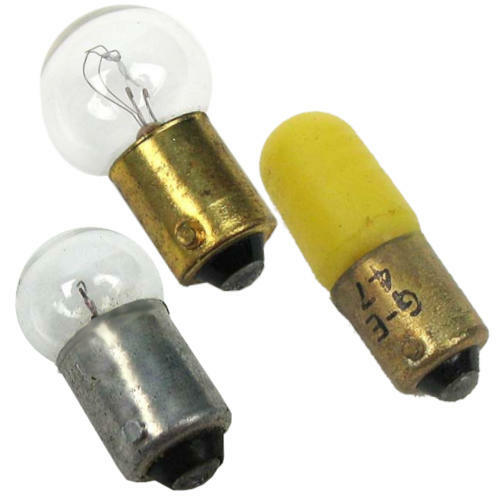 (type E5 or E5.5) 1/2" long overall it needs 160ma @ 2.5 V. It has a clear glass envelope that collimates the light at the end for greater intensity when viewed end on. Typically priced around a buck a each. Great for science fair projects. model railroading or anywhere tiny light is required. The Spirit Of The Bayonet Fighter? 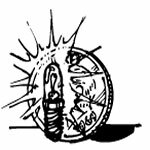 Forget what they told you in basic training, the spirit of these bayonets is to cast a little incandescent light on things, little being the operative word. Little like dollhouses, dioramas and other DIY projects. You pick: the 7/16” dia clear bulb, drawing 150mA at 9V, with a bayonet base; the 9/16” dia yellow bulb, drawing 150mA at 6.3V with a bayonet base; the 9/16" dia clear bulb drawing 300mA at 15V with a bayonet base; or the miniature bayonet base electrical socket for low voltage lamps, with 5” leads and a 1/2” right-angle clip. All of it’s made in the USA for GE. Very pretty. Very graceful. 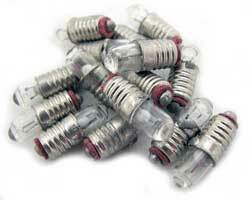 These clear-glass 2.2 volt, .25 amp bulbs are a wavy, flame shape 1-1/2" tall and 5/8" dia at the widest point. The base is candelabra size. 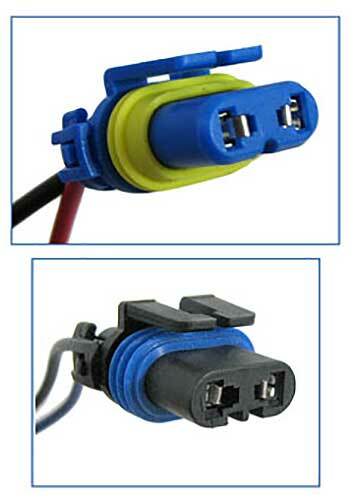 They work fine on 3 volts (2"AA") at .32 amps. Order extras, because we don't think you'll find little pretties like these at your local hardware store. 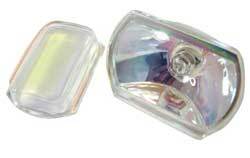 This 12V 35W Racing Series halogen lamp is made for automobile use and comes with a matching gasket and a 1/2" deep lens with a slight amber tint. (You'll need to epoxy the lens on if you're not mounting the lamp in another bracket.) 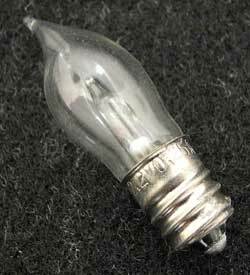 Bulb is 2-1/2" wide x 1-11/16" tall x 1-1/2" deep with a 2-pin connector. Pins are 1/4" apart on the outside. No, not knives. These are bayonet bulbs, so named because you push them in and twist, just like mounting a bayonet. Our each is a 2-pack of 12V 8W bulbs, most likely for automotive use. From NAPA, packages of (2) high-temperature headlight sockets. You pick: #787110, 9006 2-wire, 1-1/8" wide x 5/8" x 1-1/4" deep with (2) 5" leads or #787138, 9005 2-wire, 1-1/16" wide x 5/8" x 1-5/16" deep with (2) 6" leads. 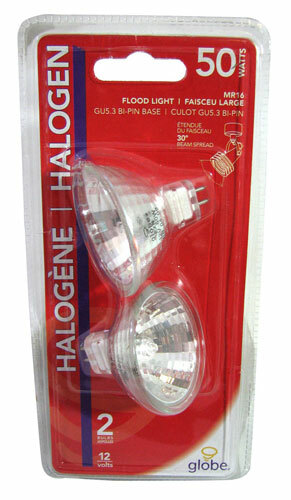 Our each is (2) 50W,12V halogen bulbs with standard GU5.3 bi-pin bases. For low-voltage systems, bulbs are 1-7/8 dia, MR16 reflector flood lights with a 30-degree beam spread.